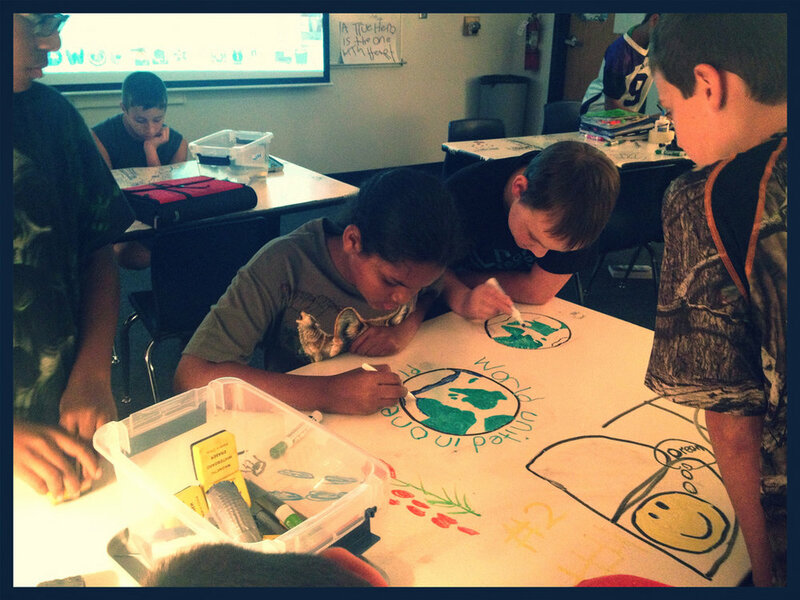 Rachel's Challenge Social-Emotional Learning Experience plus Art and IdeaPaint. A sunny and hot Friday; September 6, 2013Rachel's Challenge presentation is today; we have one every 3 years so all 6, 7, 8 graders experience it.6th graders have heard team teachers say: It's powerful and moving; all 3 team teachers cry by the end of it. My takeaways (tweets) from the 50 minute assembly. 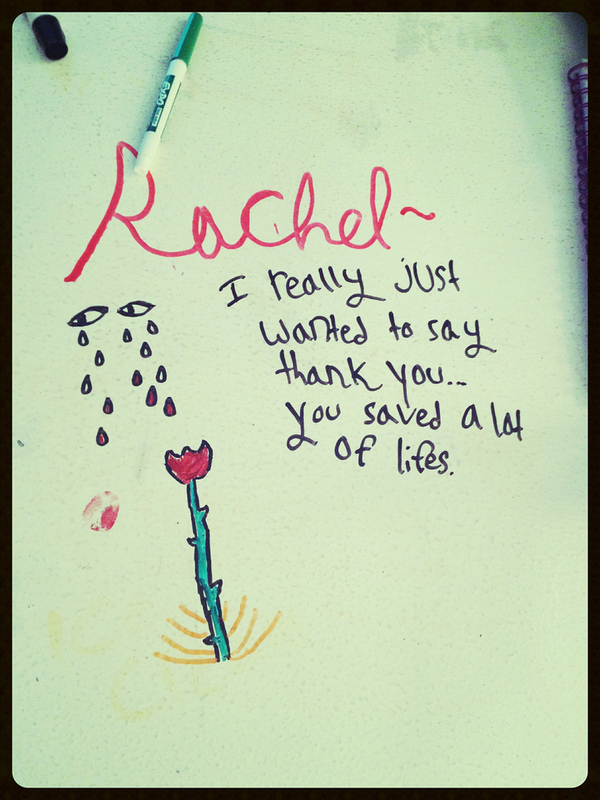 Our Rachel's Challenge facilitator was someone we thought looked familiar but we couldn't quite put our finger on. Hmmm. I stopped and introduced myself to Michael Dorsey afterwards and thanked him for his energy and leadership. I asked him if he was on Twitter. At his 'yes,' I asked for his Twitter handle. He shared it with me. Long story short, I forgot it by the time I was ready to use it -- a whole 2 minutes time. Back I went to see him. He told me again and at my curious looks he said, "You may recognize me from The Biggest Loser." Ahhh yes!!! Picture time! Back I go to tell my 2nd hour this news, but first I tweeted this out. "I know why you know him!" I tell the kids. Eyes big. Anticipation. 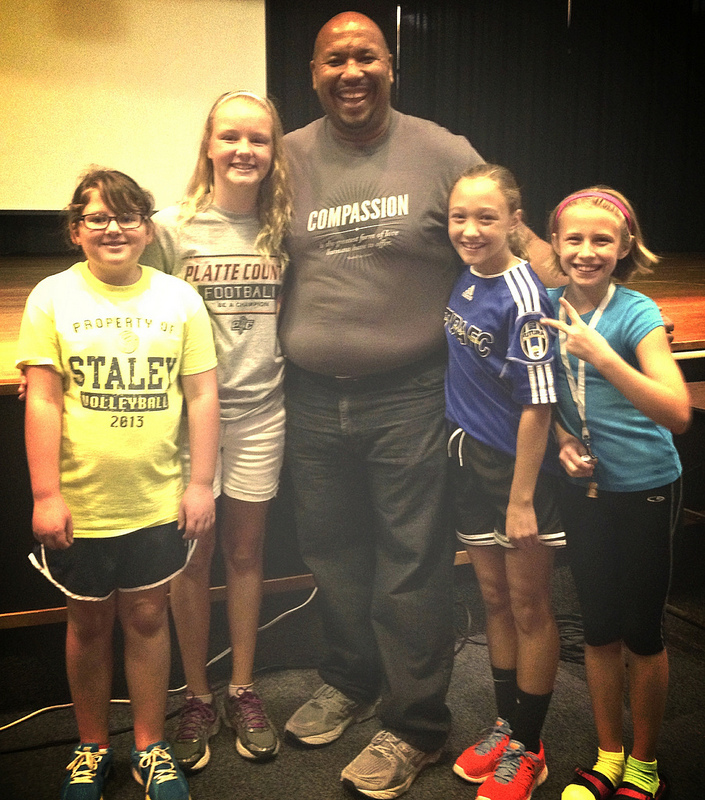 "You know him from The Biggest Loser...." A couple of my girls jumped up OUT of their seats squealing, "I LOVE that show!" I hear snippets of chatter about how inspirational he was and about his child and his STORY from the show. 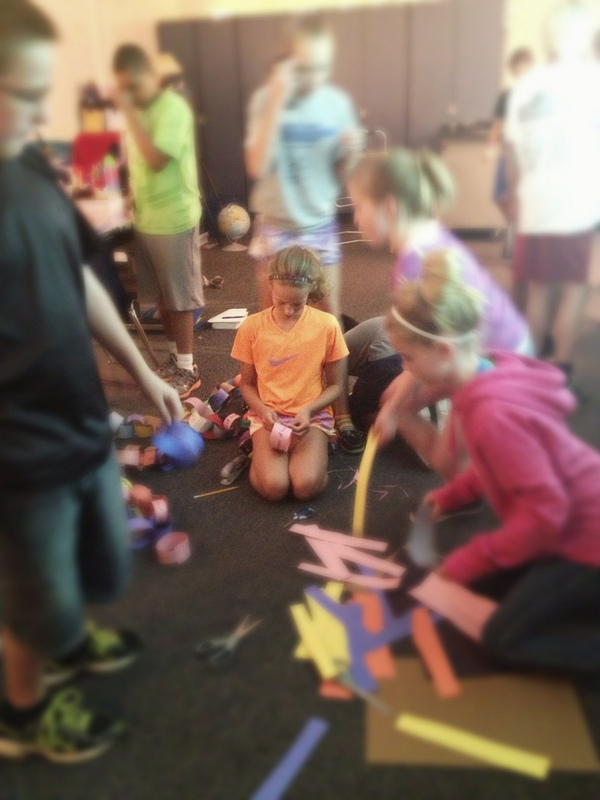 The Story Gets BetterThe ladies in yellow and blue stayed to help clean up at the end of 2nd hour. 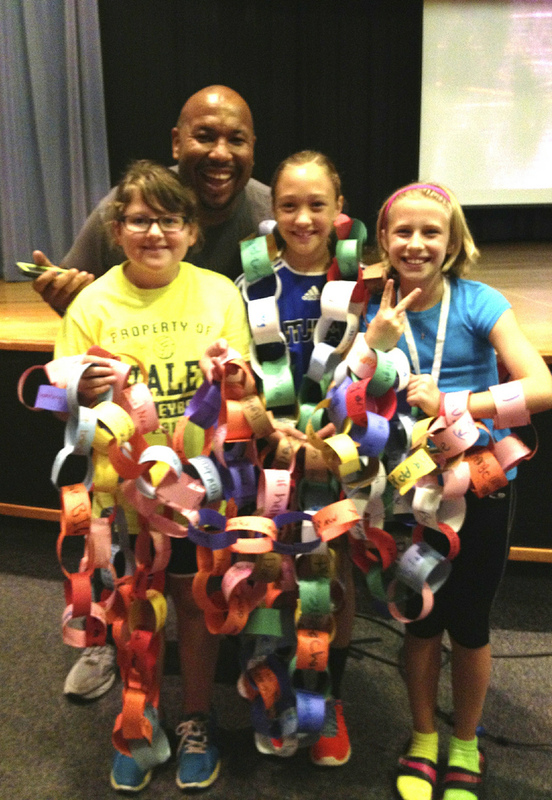 They were hopeful the 2nd assembly would get over so they could show Michael what the class made at Rachel's challenge to do so--the chain. What do you know, the timing worked out. They were grinning from ear to ear. Well, these girls knew one other girl who SO wanted to meet Michael Dorsey. This girl was the one that jumped out of her seat and talked on and on about him during 2nd hour. Could we try to make her day?! Note: A couple of the girls decided they want to be coaches on that TV show AND do what Michael did today, speak for Rachel's Challenge to help kids and learning communities find a way to act and exist that brings peace, happiness, and belonging. After the Rachel's Challenge presentation yesterday morning, I let each of my hours go where they needed to go in terms of processing the emotional presentation. Each class chose NOT to do the M&M's experiment we had planned for today. 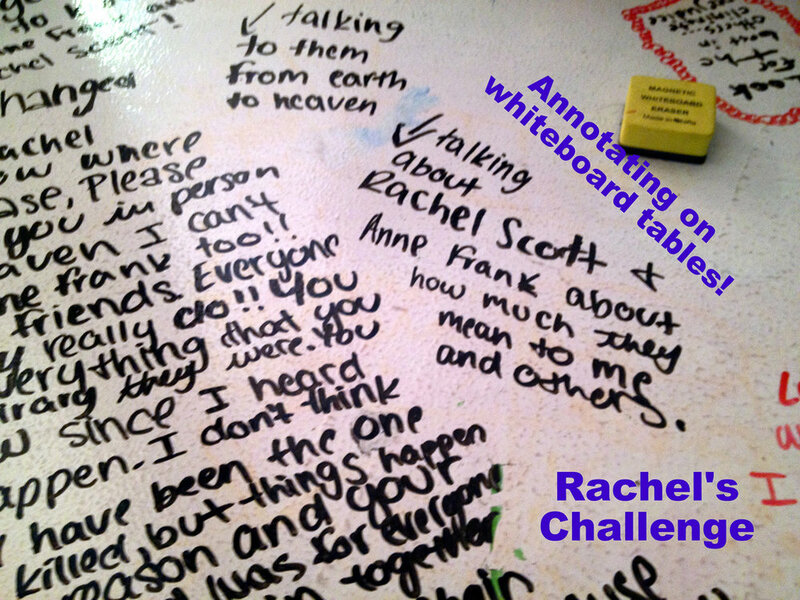 All classes ended up writing/drawing/expressing themselves on our IdeaPaint whiteboard tables (writings, quotes, drawings) for a good while (longer than I'd expected) and then writing their own positive thoughts on paper and making a long physical paper chain--thanks to Rachel's challenge to do so. They wanted to go outside to stretch out the chain and take pictures to document their work and their caring. I took *a few* pictures. 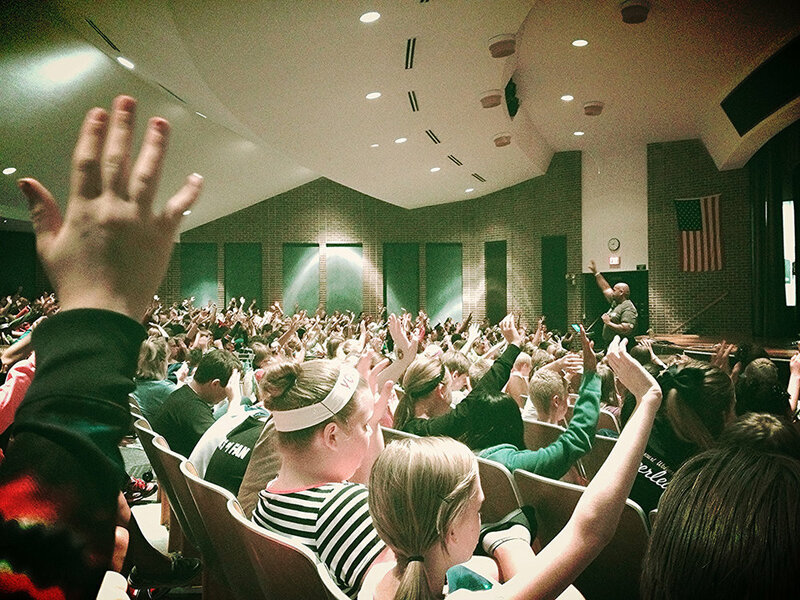 The kids cannot wait to see the visual story of our Rachel's Challenge Day -- and see themselves as 'actors' in it. I'll show this to them tomorrow. I am still spurred on by the keynote of Darren Kuropatwa in NKC encouraging us to make things VISUAL and to tell STORIES and let kids lead their learning--as a big and vibrant learning community. 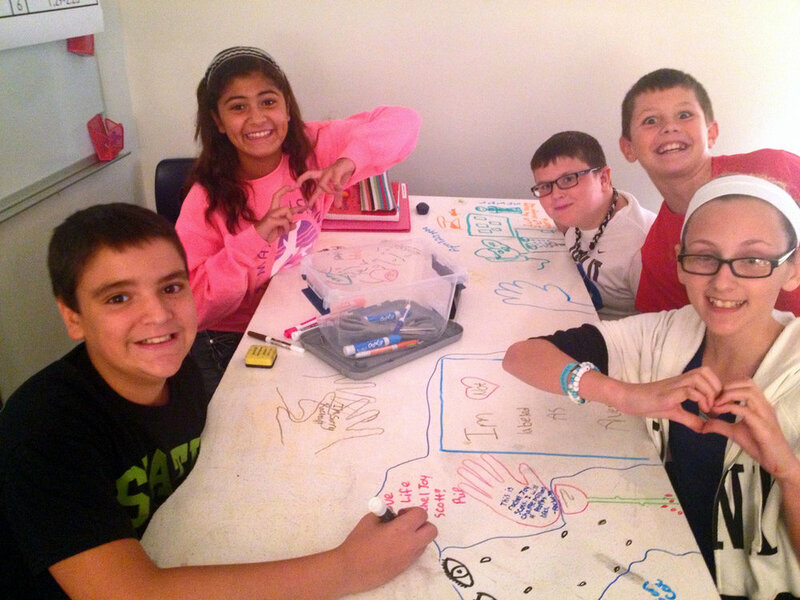 IdeaPaint Tables were a CANVAS for kids to express their thoughts and emotions. I played Jewel's "Hand" at a student's request during each class. This was the background music for the ending video in the Rachel's Challenge assembly. Powerful. Kids were thoughtful and caring and absolutely invested in expressing themselves on the tables and later in the paper chain.My only prompt at the start of class was this: I want you to think about the assembly today and express yourself on the tables or paper or both. I had my tweets up on the screen. One of my favorite pictures. Everything you see was done and designed by them, including chain. Engaged kids. 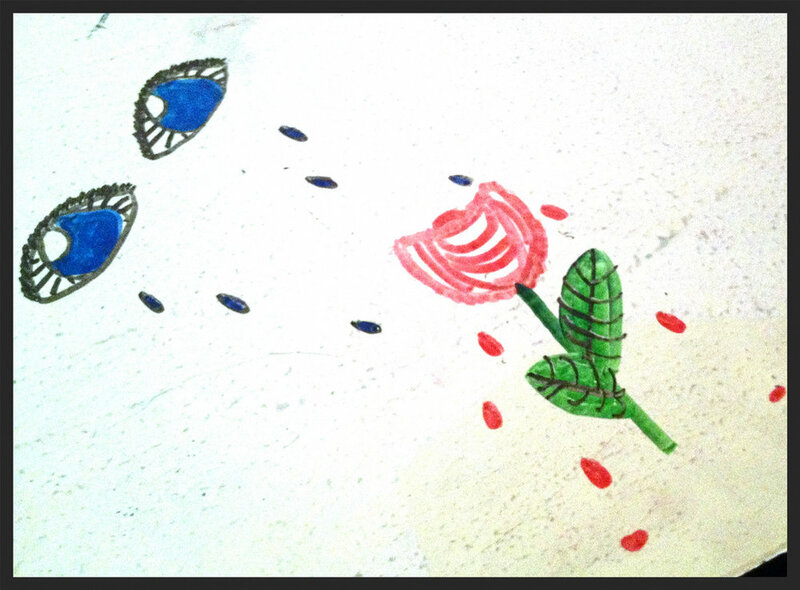 Blank walls waiting to be decorated using visuals effectively. Our iPads just arrived today. A poignant picture to me. So much thought and care. She wrote more on paper, too. Another student comes by to read and observe. Serious contemplation; now writing in her Science Smash Journal. So much detail and caring. 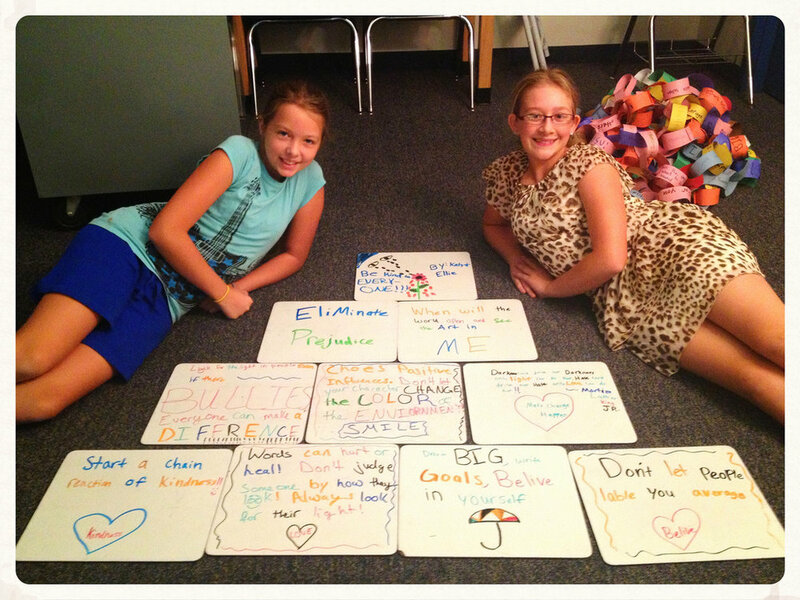 These girls worked in the open workspace in the room with our mini-whiteboards. Creative. Awesome. This table is split into 3 parts in a cool way. Wisdom from an 11 year old. This picture touched my heart! Views from the room and from our time outside. 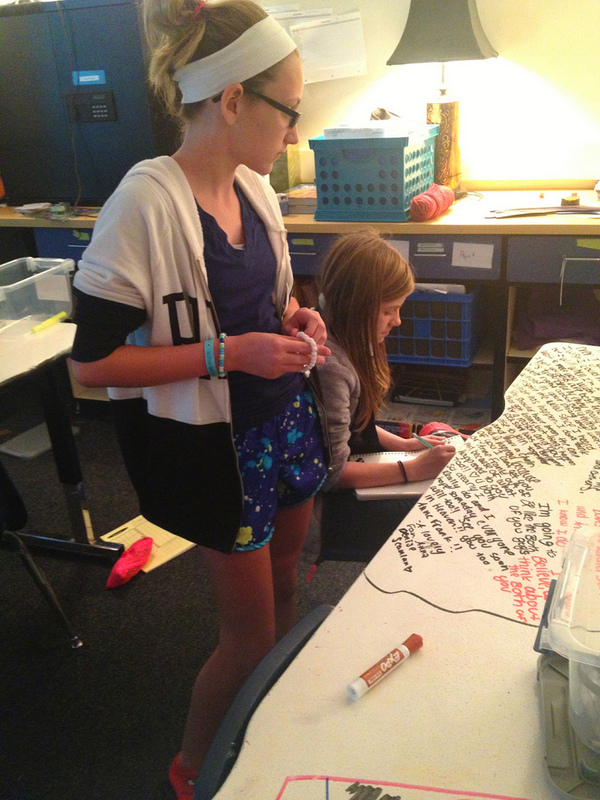 See 2 different collaboration groups here: 1 making chain, other looking at Golden Rule poster. The chain is now 3 classes long (entire team) and about ready to travel outdoors! A smile from the sea of positivity. The Golden Rule is a giant UMBRELLA over us, protecting us if we all follow it! 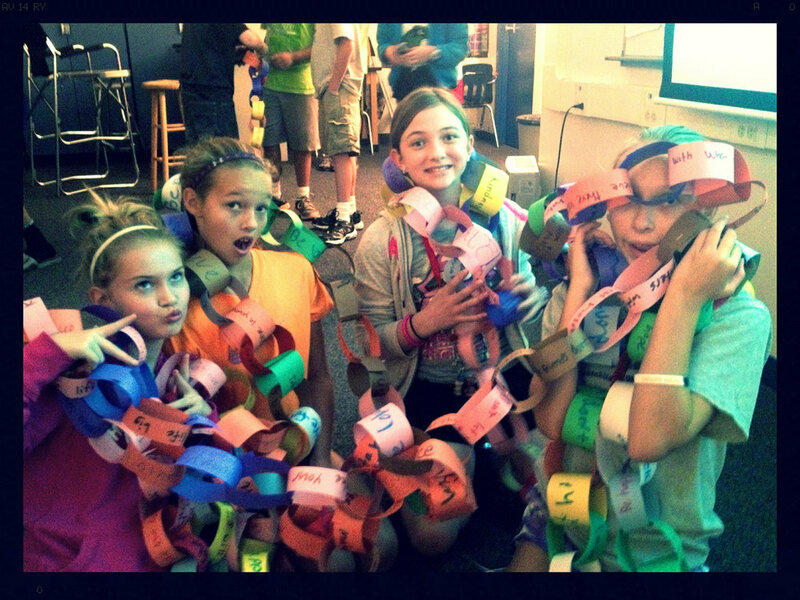 The chain created by 2nd hour kiddos! All their idea. 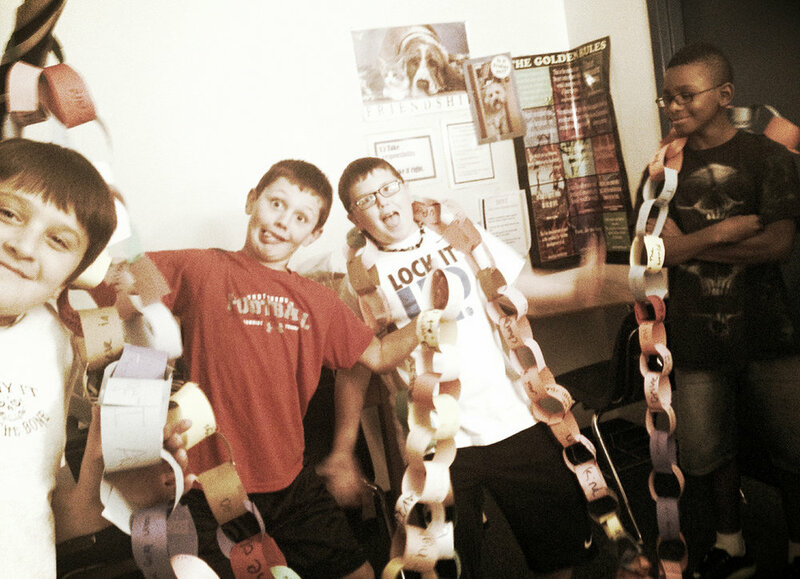 Chain as created by 5th hour. They added to 2nd hour's chain. GROWING! 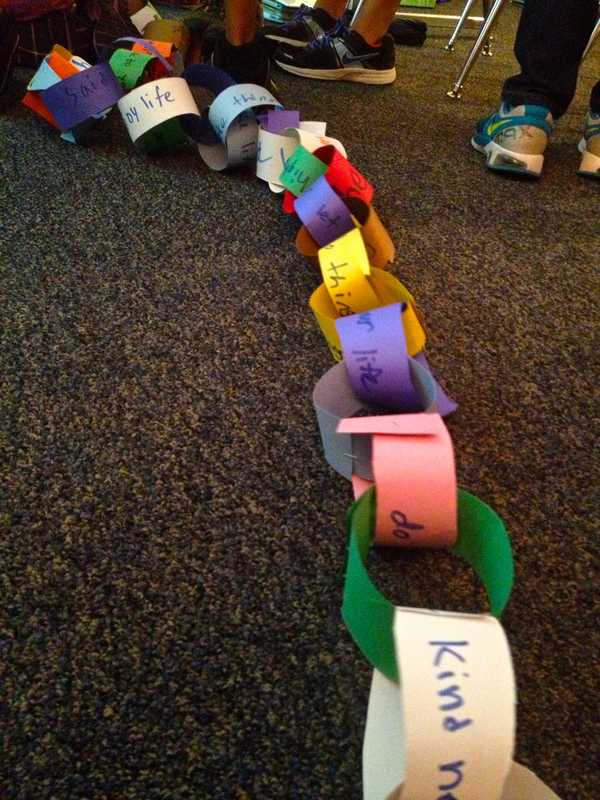 Chain now has positive links from all kids on the team and stretches far. 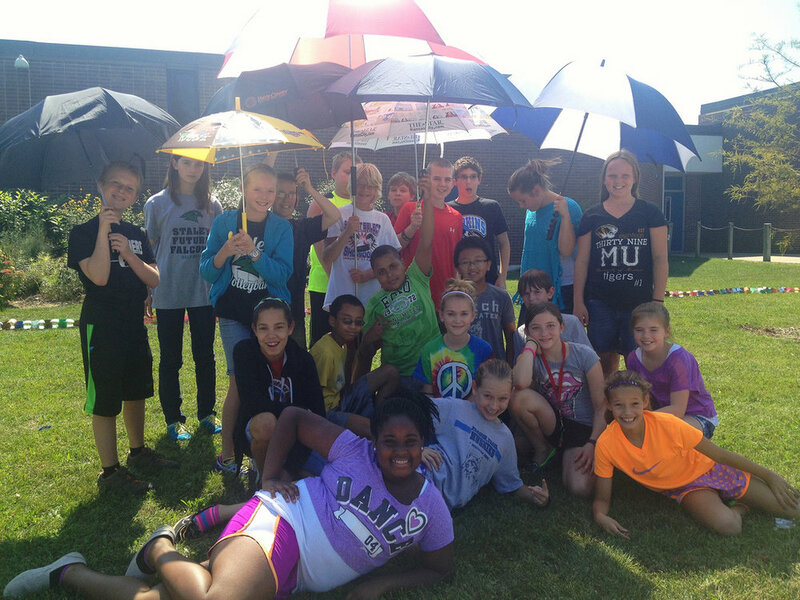 Both the chain and the umbrellas together--perfectly paired on Rachel's Challenge Day. Be you. 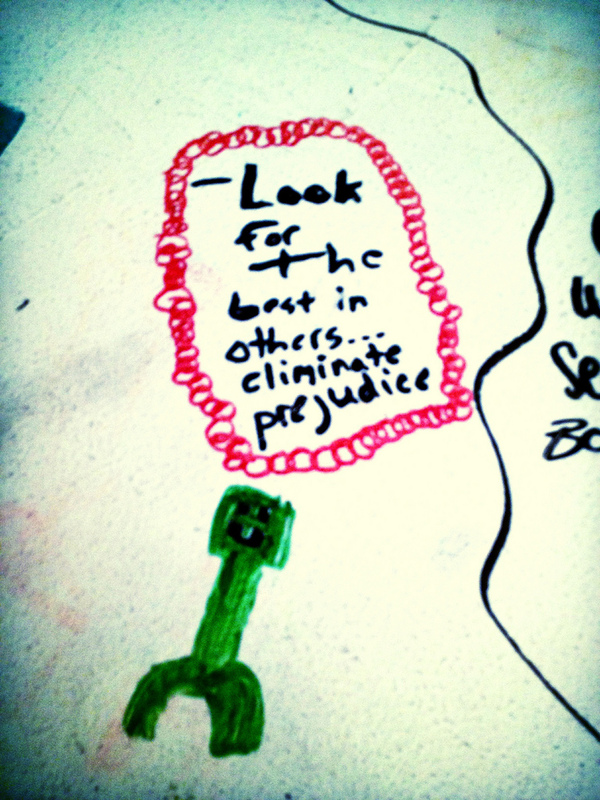 Treat others the way you want to be treated. Community. THEY ADDED THE CHAIN TO THE UMBRELLAS. Perfect. View from under the symbolic Golden Rule Umbrella. Great place to be! Signed at lunch by entire school and staff! This day goes down in my top 5 teaching days in my 19 years as a K-12 educator. 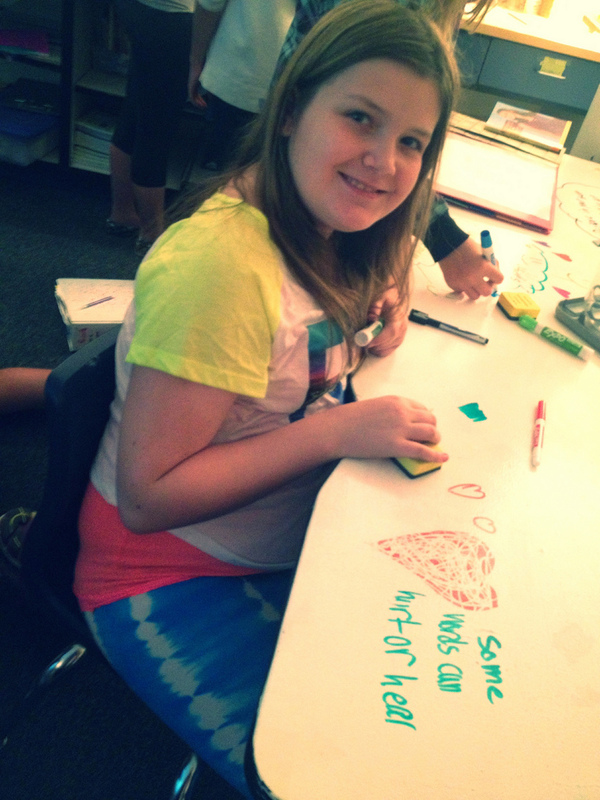 I did not have the whiteboard tables 3 years ago when we last had the Rachel's Challenge assembly.